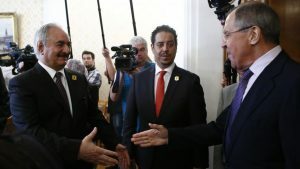 Russian Foreign Minister Sergei Lavrov underlined Monday at a meeting in Moscow with Field Marshall Khalifa Haftar of the Libyan National Army (LNA) that Russia supports a political solution to the Libyan crisis and “the full-scale restoration of the statehood” of the North African country. 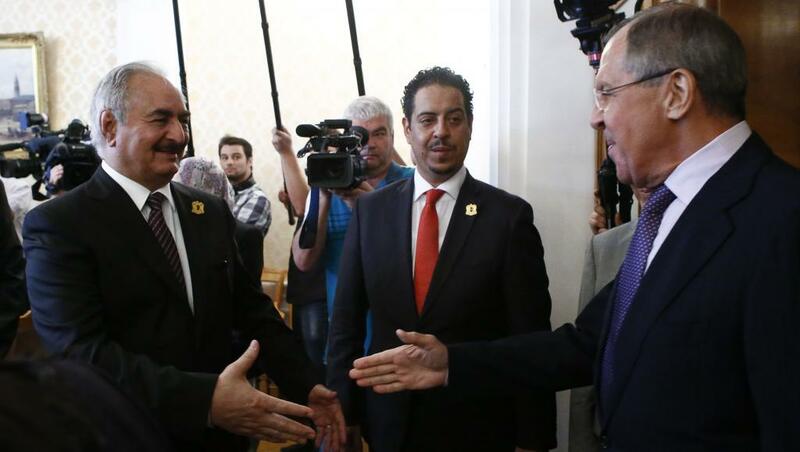 Lavrov admitted that the situation in Libya remains difficult and that the threat posed by extremism persists. He welcomed last month’s meeting held near Paris between Haftar and Faiez Serraj of the Presidency Council. He also expressed hope that new UN Special Envoy Ghassan Salame will “focus all mediation and efforts and ideas on the political front on the basis of the activities of the United Nations” while promoting “the most favorable conditions for a dialogue between key figures in Libya, so that they themselves agree on the future of their country”. Russia wants “all major political forces, tribes and regions” to undertake the path of dialogue, he insisted. Moscow has been supportive of the renegade military official’s actions in the war-torn North African country. Haftar claimed that his forces have liberated “roughly 90 percent of the country” in their fight against terrorism amid the “unlimited financial and military support for terrorists.” Armed groups in Libya have often referred to their rivals as terrorists. The Field Marshall thinks that the UN arms embargo is negatively affecting his military operations. Haftar’s visit to Moscow is his third since November 2016. Under the Gadhafi regime, Russia was leading supplier in arms to the North African country. Posted by Jaber Ali on Aug 15 2017. Filed under Headlines, World News. You can follow any responses to this entry through the RSS 2.0. Both comments and pings are currently closed.